When you connect to a website, it is not only the operators of that website who can record information about your visit. Most websites now use numerous third-party services, including social networking “Like” buttons, analytics trackers, and advertising beacons, all of which can link your activity across different sites. Using the Tor network stops observers from being able to discover your exact location and IP address, but even without this information they might be able to link different areas of your activity together. For this reason, Tor Browser includes some additional features that help you control what information can be tied to your identity. Tor Browser centers your web experience around your relationship with the website in the URL bar. 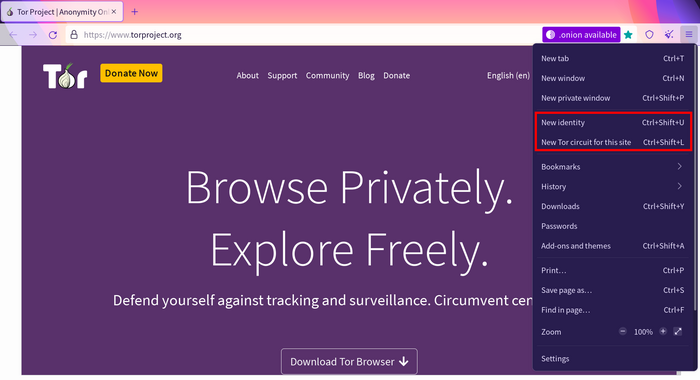 Even if you connect to two different sites that use the same third-party tracking service, Tor Browser will force the content to be served over two different Tor circuits, so the tracker will not know that both connections originate from your browser. On the other hand, all connections to a single website address will be made over the same Tor circuit, meaning you can browse different pages of a single website in separate tabs or windows, without any loss of functionality. Although Tor Browser is designed to enable total user anonymity on the web, there may be situations in which it makes sense to use Tor with websites that require usernames, passwords, or other identifying information. If you log into a website using a regular browser, you also reveal your IP address and geographical location in the process. The same is often true when you send an email. Logging into your social networking or email accounts using Tor Browser allows you to choose exactly which information you reveal to the websites you browse. Logging in using Tor Browser is also useful if the website you are trying to reach is censored on your network. See the Secure Connections page for important information on how to secure your connection when logging in.